Drunk driving is a common cause of car accidents ranging from both minor to severe. Many DUI accidents result in the catastrophic injury or death of the person(s) in the other vehicle. In fact, if you are injured or lost a loved one in a DUI accident, life won’t be the same. Here’s what you need to know about drunk driving car accidents and how to obtain the full and fair compensation you deserve. DUI accidents result in many different types of penalties for the drunk driver. First, the drunk driver faces the loss of his or her license by the Department of Motor Vehicles. Additionally, the driver faces criminal charges. These charges range from a first-time DUI to vehicular manslaughter if the accident resulted in death. Third, the driver will face civil penalties when the victims of the accident bring claims forward for compensation. Often, injured parties will work with the drunk driver’s vehicle insurance company. Usually, compensation comes from them. Compensation comes from other places too, if more than one person is negligent. For example, if a bartender knowingly served alcohol to an overly intoxicated person and then knowingly allowed them to drive themselves. An insurance company typically offers a small settlement at first. However, don’t let that discourage you. If you lost a loved one, are severely injured, or both, you deserve full and adequate compensation. Compensation could include medical expenses, vehicle damage, funeral costs, lost wages, lost future wages, and pain and suffering. After a drunk driving accident, you are confused, angry, and unsure of where to turn or who can help you through the difficult process of dealing with legal matters. 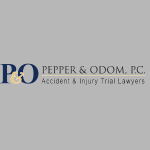 At Pepper & Odom, P.C., we have the experience and skills to represent you through each stage of your case against the drunk driver who hurt you and your family. Our goal is to help you obtain the maximum settlement award possible in your case, so you can begin to move forward after such a devastating and life changing event. Contact us today for a consultation to discuss your unique legal needs and to learn more about what your next step should be after a DUI accident. Call now at (601) 202-1111 or (205) 250-1107.